• Fashion Week is still going strong, and I made "The Cut" in New York Magazines best street style for day 6 of the shows while handing out copies of PINNACLE. 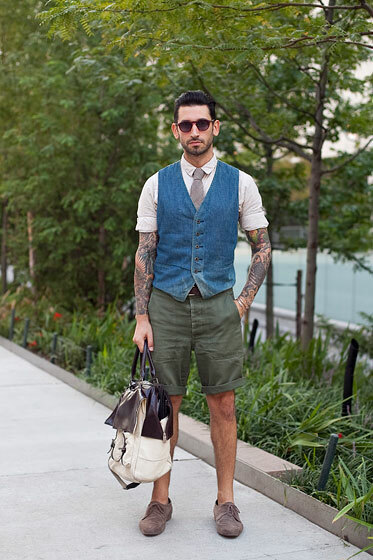 I am sporting my very own Brave GentleMan tie, Ben Sherman faux-leather and canvas bag, M:Zero shoes, organic cotton Velour shirt, vintage vest, military surplus shorts, and vintage frames. • Can you be vegan and a butcher? Marc Mongiardo thinks so. But isn't that a little like being a pacifist MMA fighter? Or a Hhman Rights Activist who also works in human trafficking? I'm confused. • Vegan Bodybuilder Robert Cheeke suggestively weighs in on how to keep on, build up, and maintain healthy weight for dudes who don't eat animals. Banana anyone?